A Chaser is a powerful and creative tool within MADRIX. It offers a lot of possibilities to further customize visuals or your workflow in MADRIX. You can set up a Chaser to remember specific settings. MADRIX can then automatically chase them or can manually load and control them as needed. - Can be used as a playlist to change and customize visuals. - Is a list of Steps played back as a sequence. - Can be time-controlled or controlled manually. - Each Step remembers the settings as you configured them. - Can even be used to create animations. ▪ Can be configured for every single Layer. ▪ Visuals can be customized by chasing MADRIX Effect settings and Layer settings. ▪ Is different to the Cue List. Each Cue in the Cue List references a single Storage Place. 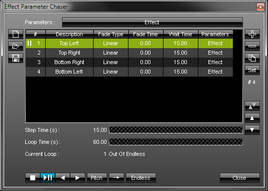 An Effect Parameter Chaser can be used independently from the Cue List and can be set up for each single Layer. ▪ Can be configured for every single Storage Place and can include every single Layer of that Storage Place. ▪ Visuals can be customized by chasing Storage Place settings and Layer settings. ▪ Is different to the Cue List. Each Cue in the Cue List references a single Storage Place. A Storage Place Parameter Chaser can be used independently from the Cue List and can be set up for each single Storage Place. ▪ Can only be used to chase fixture group values. 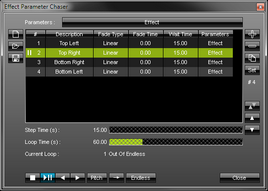 An Effect Parameter Chaser, for example, offers many ways to customize visuals. In this first example, we will use the Effect Parameter Chaser to set 4 different movement directions for SCE Color Scroll within 60 seconds. 1] Select which kind of Parameters to include for a Step. 3] Control the Chaser playback. You can use each Step to change a variety of settings. - You can freely choose which kind of Parameters should be included in a Step. - Each Step can include different kind of Parameters. - That also means that you can exclude certain kind of Parameters for each Step. - Only the kind of Parameters that has been selected and is therefore included in a Step will be chased. - Parameters that are not included in a Step will not be chased and can still be used in the normal way. - Any combination of the settings described below is possible. - Left Mouse Click - Opens the Parameters submenu for selection. ▪ All - Includes all available Parameters in a Step [Effect Settings, Layer Visibility Settings, Layer Submaster, Layer Map Settings, Layer Mix Settings, Layer Filter]. ▪ None - Includes no Parameters [can be used to add empty Steps/pauses, for example]. ▪ Effect Settings - When selected, includes all the individual settings of a MADRIX Effect that are exclusive to this effect. - This can be any effect setting, such as colors, directions, modes, etc. - You can change single effect settings or multiple effect settings at the same time. - Note: Steps that include Effect Settings as Parameters will only fully work for the same kind of MADRIX Effect! 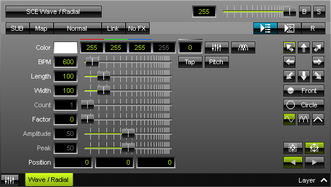 The Effect Settings of such a Step will be ignored by other MADRIX Effects. ▪ Layer Visibility Settings - When selected, includes the visibility settings of this Layer, including Opacity, Blind, and Solo. ▪ Layer Submaster - When selected, includes submaster of this Layer. ▪ Layer Map Settings - When selected, includes the Map Settings of this Layer. ▪ Layer Mix Settings - When selected, includes the Mix Mode and Link Mode settings of this Layer. ▪ Layer Filter - When selected, includes the Filter [FX] settings of this Layer. ▪ OK - Confirms your selection of Parameters and closes the Parameters submenu. ▪ All - Includes all available Parameters in a Step [Storage Place Submaster, Storage Place Speed Pitch, Storage Place Filter, Layer Visibility Settings, Layer Submaster, Layer Map Settings, Layer Mix Settings, Layer Filter]. ▪ All Storage Place Settings - Includes all available Storage Place Parameters in a Step [Storage Place Submaster, Storage Place Speed Pitch, Storage Place Filter]. ▪ All Layer Settings - Includes all available Layer Parameters in a Step [Layer Visibility Settings, Layer Submaster, Layer Map Settings, Layer Mix Settings, Layer Filter]. ▪ Storage Place Submaster - When selected, includes the submaster of the Storage Place. ▪ Storage Place Speed Pitch - When selected, includes the speed pitch of the Storage Place. ▪ Storage Place Filter - When selected, includes the Filter [FX] of the Storage Place. ▪ Layer Visibility Settings - When selected, includes the visibility settings of all Layers, including Opacity, Blind, and Solo. - These are the same Layer settings, which the Effect Parameter Chaser can control for a single Layer. ▪ Layer Submaster - When selected, includes submasters of all Layers. ▪ Layer Map Settings - When selected, includes the Map Settings of all Layers. ▪ Layer Mix Settings - When selected, includes the Mix Mode and Link Mode settings of all Layers. ▪ Layer Filter - When selected, includes the Filter [FX] settings of all Layers. ▪ It is not necessary to select any Parameters, since only one set of Parameters can be chased [fixture group values]. A Chaser is represented by a list of Steps in the Chaser window. - Add and configure or edit Steps as needed. - A Chaser normally runs through the list in a sequence. The order is defined by the Playback Mode. - When a loop is set up, the Chaser repeats. Add Step - Adds a new Step to the list. - The newly added Step includes all currently set Parameters [according to your Parameters selection. Learn more Selection Of Parameters]. - A newly added Step will be created with the default values for Fade Time, Fade Type, Wait Time, and Description. - First, make sure that the visuals look as intended, that all settings are defined as required, and then add the Step. - Please stop the Chaser if it is currently running. Remove Steps - Removes all currently selected Steps from the list. Duplicate Steps - Copies the currently selected Steps and adds them as new Steps to the list. Set - Updates the Step by overwriting the saved settings in the Step with the current settings. Synchronize Parameter Selection - Is only visible when necessary and if a Step is selected. Shows that your current selection of Parameters [learn more Selection Of Parameters] is different to the Parameters of the selected Step [learn more Parameters]. In order to set the selection of Parameters to the Parameters of the Step, click the equal sign. Swap Position - Swaps the position of Steps in the Step list when several Steps are selected first. Position Up - Changes the order, and positions currently selected Steps one item higher up in the list. Position Down - Changes the order, and positions currently selected Steps one items lower down in the list. ▪ Shows the index number of this Step in the list. - This index number cannot be edited in the list. ▪ Allows you to provide a label for the specific Step. Perform a left mouse double-click and enter any name or text. - The default value is Step. ▪ Defines how the Step is faded in, when a Fade Time has been set. - You can choose from a variety of types [Linear, Ease In Bounce, Ease Out Bounce, Ease In Out Bounce, Ease In Circular, Ease Out Circular, Ease In Out Circular, Ease In Cubic, Ease Out Cubic, Ease In Out Cubic, Ease In Sinusoidal, Ease Out Sinusoidal, Ease In Out Sinusoidal, Ease In Exponential, Ease Out Exponential, Ease In Out Exponential]. - The default value is Linear. ▪ Defines how long the Step is faded in [in s]. Change it to any time. This creates an automatic transition from one Step to another Step. - When possible a smooth transition is automatically created by gradually increasing or decreasing values for Parameters. - Certain Parameters can be used for a smooth transition. - Certain Parameters cannot be used for a smooth transition and will be selected or switched on or off at the beginning of the Fade Time. - The transition is affected by Fade Type and Fade Time. - Valid values range from 0.0 to 99999.99. - The default value is 0.0 [which means that there is no transition/fade-in by default]. ▪ Defines how long the Step is shown before skipping to the next Step in the list [in s]. - Is separate from the Fade Time, which means it does not include the Fade Time. - The default value is 1.0. ▪ Shows which Parameters were included for this specific Step. - This column cannot be edited in the list. ▪ Shows the duration of the currently selected or currently running Step in seconds as well as graphically as a progress bar. ▪ Shows the duration of the overall loop including all Steps in seconds as well as graphically as a progress bar. ▪ Shows in which loop the Chaser currently is. Only when an overall loop has been completed, the count will be increased. Open - Loads a previously saved Chaser from an external file [of the file type *.mepcz or *.mepcx for Effect Parameter Chasers; of the file type *.msppcz or *.msppcx for Storage Place Parameter Chasers; of the file type *.mgvcz or *.mgvcx for Group Value Chasers]. - A new window opens for you to select the file on your harddisk. Save - Saves the Chaser to an external file. Stop - Stops the Chaser. Stopped - Shows that the Chaser has been stopped. Play/Pause - Starts the Chaser or pauses the playback and remembers the current position. - Playback will continue from the current position if the Chaser has been paused. Playing - Shows that the Chaser is currently running. Paused - Shows that the Chaser has been paused. Previous Step - Returns to the previous Step and plays back that Step. - If the Chaser has not been running, playback will stop after the Fade Time of this Step has passed. 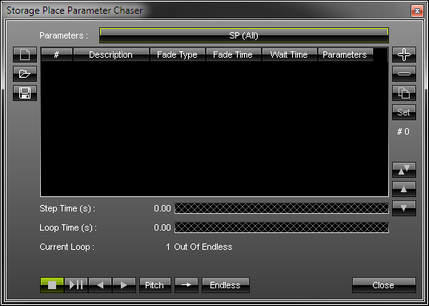 - If the Chaser is running, playback will continue with the following Step automatically. Next Step - Skips to the following Step and plays back that Step. Pitch - Defines the overall speed of the Chaser and the Step List. It works as a multiplier/a factor. ▪ Example: A pitch of 2.0 will double the current speed. ▪ A value of 0.0 will stop the Chaser. ▪ Negative values will reverse the playback direction. When setting a negative pitch during playback, the current Step will be fully played and only after its Step Time is over, the following Step will be chased. Playback Mode - Defines in which order Steps are played back. This only affects the order in the Step List, not the playback direction of a Step itself. - Forward - Steps will be played back in the order of the Step List. - Backward - Steps will be played back as configured in the Step List but backwards. - Ping Pong - Steps will be played from top to bottom in the Step List and then from bottom to top again. The first and last Step will be played only once every time. - Random - Steps will be chosen randomly and only once during a single loop. The random order remains when pausing playback. Only when stopping the Chaser, the order will be randomly created again. Loop Count - Defines how often the Chaser is being played. 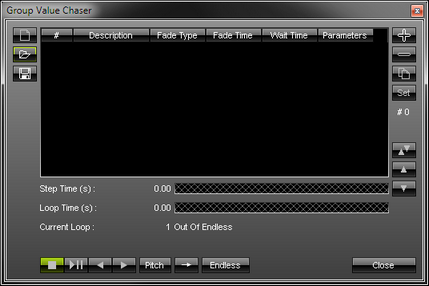 - Endless - The Chaser will always run until you manually stop or pause it. - 1x - The Chaser will run once and automatically stop at the end of the last Step. - 2x to 100x - The Chaser will run multiple times as indicated by the loop number. ▪ Left Mouse Double-Click - Perform a double-click with your left mouse button directly on the index number of a Step [as shown in the column # of the Step list]. - Activating a Step is possible at any time when the Chaser is running. Playback will automatically continue with the following Step. ▪ You can resize the window according to your needs by dragging the window borders outwards or inwards. ▪ When configuring Steps in the Step list, you can choose to set up a specific Fade Time and Fade Type. - When setting up a Fade Time that is higher than 0.0, MADRIX will automatically create a transition from one Step to another Step [fade-in]. - A transition/fade-in is specified by the Fade Time and the Fade Type. - When leaving the default value of 0.0 [or when manually setting up a Fade Time of 0.0], the Step will not be faded in. ▪ When possible a smooth transition is automatically created by gradually increasing or decreasing values for Parameters. In this way, you can create animations. - Any settings or modes where only one selection is possible at a time. Example: Direction, Look-At Type, Shape, Shape Alignment, Filter [FX], etc. ▪ Many Effect Settings can be used to create transitions/animations. ▪ Many Map Settings are very suitable to create transitions/animations. ▪ Such a procedure may be similar to a Key Frame Animation, where each Step in MADRIX represents a key frame of the animation. The following example shows a simple animation in 4 Steps by using an Effect Parameter Chaser and only changing the Effect Setting Position of SCE Wave / Radial [while all other Parameters remain unchanged with their default values]. 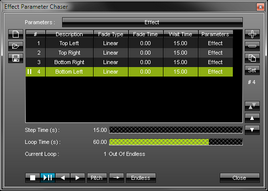 Effect Parameter Chaser - The Fade Time is set to 1.0 and the Fade Type is set to Linear. The Wait Time is set to 0.0. This means that MADRIX will automatically create a smooth animation, when possible. In this example, it is possible. 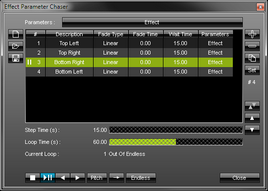 Effect Parameter Chaser - The Fade Time is set to 1.0 and the Fade Type is set to Linear. The Wait Time is set to 0.0. MADRIX will gradually increase the value of Position, until the values of Step 2 are reached. In this example, the center of the SCE Wave /Radial effect will be moved to the left. Two seconds have past. 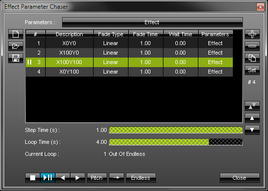 Effect Parameter Chaser - The Fade Time is set to 1.0 and the Fade Type is set to Linear. The Wait Time is set to 0.0. MADRIX will gradually increase the value of Position, until the values of Step 3 are reached. In this example, the center of the SCE Wave /Radial effect will be moved to the bottom. Three seconds have passed. 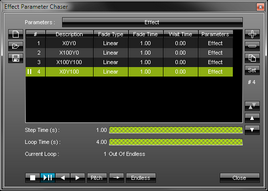 Effect Parameter Chaser - The Fade Time is set to 1.0 and the Fade Type is set to Linear. The Wait Time is set to 0.0. MADRIX will gradually increase the value of Position, until the values of Step 3 are reached. In this example, the center of the SCE Wave /Radial effect will be moved to the left. Four seconds, which is the total Loop Time, have passed. Since the Loop Count is set to Endless, MADRIX will continue with Step 1 again. In this example, the center of the SCE Wave /Radial effect will be moved to the top. This means the animation runs smoothly and endlessly. - Shows that the Chaser is currently running and being played. - Shows that a Chaser has been set up, but it is currently paused. ▪ Open the context menu and use the playback options of the context menu. ▪ Open the Chaser window and use the provided playback controls. The main options are also available via a context menu. ▪ Add Step : - Immediately adds a new Step to the Step list of the Chaser. 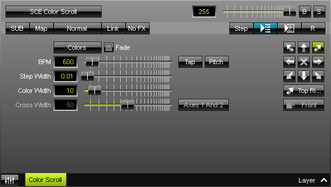 The currently chosen Parameters that will be included in the Step are shown after the colon [e.g., Add Step : Effect shows that the Effect Settings are included for an Effect Parameter Chaser, for example]. ▪ Open... - Loads a previously saved Chaser file. - Effect Parameter Chaser files of the file type *.mepcz or *.mepcx. - Storage Place Parameter Chaser files of the file type *.msppcz or *.msppcx. - Group Value Chaser files of the file type *.mgvcz or *.mgvcx. ▪ Copy - Copies the current Chaser into the clipboard as a duplicate. ▪ Paste - Inserts a copy of a Chaser from the clipboard into the currently selected Chaser. ▪ Stop - Stops the Chaser. ▪ Play - Starts the Chaser. ▪ Pause - Pauses the playback and remembers the current position. ▪ Clear - Removes any Steps and restores an empty, default Chaser. ▪ Left Mouse Click And 2 Sec. Hold - Use a left mouse click on an Effect Parameter Chaser button or Storage Place Parameter Chaser button and continue to hold for 2 seconds. A small + appears. Continue to hold and move your mouse to another Layer and Effect Parameter Chaser button or Storage Place and Storage Place Parameter Chaser button. Release the mouse button to paste a copy onto the new Chaser. ▪ A Chaser should contain at least 1 Step in the Step list. ▪ When setting up a Fade Time of 0.0 as well as a Wait Time of 0.0 for a Step, MADRIX will not ignore such a Step in the Step list. Although, this configuration says that this Step should not be displayed, MADRIX will use it as starting point for the transition to the next Step [if the next Step includes a Fade Time]. In this way, a Step with a total Step Time of 0.0 will influence the visual outcome of the transition. ▪ When a Chaser is playing, the user interface will be deactivated according to the Parameters selection of the Step. - For example, if the Step includes Map Settings, the Map button will be deactivated. - Any controls that are not deactivated, can be used in the normal way. ▪ Regarding the Loop Count and Current Loop, MADRIX counts from the beginning again, if the playback had been stopped beforehand. - Only complete loops will be counted. Inverting the Speed Pitch during a loop, will not count towards the Loop Count. - The Current Loop will be reset when performing a Clear, New, or manually removing all Steps from the Step List. ▪ Should it be necessary to calculate random values, MADRIX will generate random values once at the beginning of a Step. - Including only 1 Step can be useful when chasing an Effect Setting that generates random values [such as RND], for example. As explained above, MADRIX will generate random values once at every beginning of a Step. - Including 2 Steps or more is probably the usual case to chase Parameters. ▪ The following Layer Settings will still be available, even when an Effect Parameter Chaser is running. That also means that they cannot be chased with the Effect Parameter Chaser. ▪ The following Parameters will still be available, even when an Effect Parameter Chaser with Effect Settings as Parameters selection is running. That also means that they cannot be chased with the Effect Parameter Chaser. ▪ When chased, the following Effect Settings will cause the corresponding MADRIX Effect to start again from the beginning. Chasing these Effect Settings might therefore provide limited possibilities. 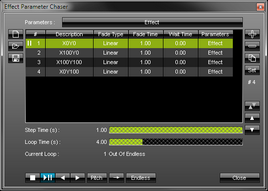 ▪ An Effect Parameter Chaser is applied to the current Layer. The Chaser will still be there even when changing the MADRIX Effect for this Layer. - Please note: Depending on your configuration, the Chaser might then work or not work for the newly selected MADRIX Effect. - To avoid problems, select another Storage Place or clear the Effect Parameter Chaser first. - When changing the MADRIX Effect for this Layer, the Chaser will be stopped. 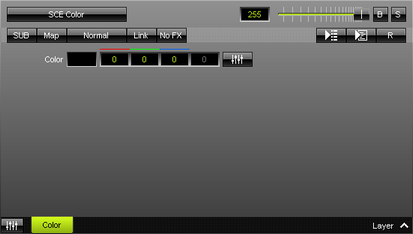 ▪ In order to configure a Chaser, the associated Layer needs to be active on the MADRIX user interface. If you change to another Layer or Storage Place, for example, the Effect Parameter Chaser window will be closed automatically. ▪ Even during Chaser playback, you will be able to control certain functionality of the Effect Parameter Chaser window [such as playback or managing the Step list]. ▪ The Speed Masters do affect the Effect Parameter Chaser. - As a result, playback speed can be increased, decreased, and the Chaser can also be played backwards [when the Speed Master has a negative value]. - A Speed Master with a negative value will let the Chaser play backwards, which means that the Steps will be played back in reversed order [and according to the Playback Mode]. - A Speed Master with a negative value will not change a fade-in [as set via Fade Time]. ▪ The Storage Place Parameter Chaser can chase Layer settings, but not MADRIX Effect settings. ▪ The following Layer Settings will still be available, even when a Storage Place Parameter Chaser is running. That also means that they cannot be chased with the Effect Parameter Chaser. ▪ When playing a Storage Place Parameter Chaser, you are also able to run an Effect Parameter Chaser per Layer. In addition, you are able to override the Layer settings of the Storage Place Parameter Chaser with the Layer settings of an Effect Parameter Chaser. ▪ When deleting a Layer after a Storage Place Parameter Chaser has been created, the Parameters of this Layer will be removed from the Chaser. ▪ When adding a Layer after a Storage Place Parameter Chaser has been created, the Parameters of this Layer will always be set to the default values in each Step. ▪ When swapping the position of two Layers after a Storage Place Parameter Chaser has been created, the Parameters of these Layers will be kept and will be correctly applied to the Layers in their new order. ▪ A Storage Place Parameter Chaser is applied to the current Storage Place. The Chaser will still be there even when changing the Storage Place. ▪ In order to configure a Chaser, the associated Storage Place needs to be active on the MADRIX user interface. If you change to another Storage Place, for example, the Storage Place Parameter Chaser window will be closed automatically. ▪ Even during Chaser playback, you will be able to control certain functionality of the Storage Place Parameter Chaser window [such as playback or managing the Step list]. ▪ The Speed Masters do affect the Storage Place Parameter Chaser.